Losing Weight Can be "Ruff!" A recent study shows that dieting with a furry friend (no, not the hairy guy in accounting) can be more effective than dieting alone. Dogs can provide their owners social support for weight loss and weight maintenance. The year-long study conducted by Northwestern Memorial Hospital and Hill’s Pet Nutrition found that dog owners who dieted with their canine pals lost slightly more weight than those who dieted alone. Want to know if either you or your pet can stand to lose a few pounds? Check out these BMI and Pet BMI calculators. The low carb craze is on the way out -- and not a minute too soon. Last week, WebMD reported that eating whole grains not only reduces your risk of heart disease, but it can actually help you LOSE weight. According to researchers, all it takes is about 1 cup of oatmeal, 3/4 cup of brown rice, or several slices of brown bread each day. The study showed that men who increased their whole grain consumption gained less weight than men who didn't. Eating 40 grams of whole grains a day cuts middle-age weight gain by as much as three-and-a-half pounds. No, this does not mean you should start scarfing down oatmeal cookies. 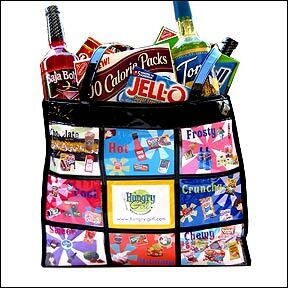 "Send to a Friend" & You Can Win This AWESOME Hungry Girl Tote! Hungry Girl is fast approaching our 10,000 subscriber mark! And to encourage YOU, our faithful subscribers to spread the word, we're giving away these ADORABLE limited edition Hungry Girl tote bags jam-packed with some of our guilt-free favorites -- like Baja Bobs Mixes, Glenny's Snacks, Wise Choice chips & more! Our 10,000th subscriber AND the person who told them about Hungry Girl will EACH win one of these cute and tasty gift packs! All you need to do is click "send to a friend" and tell your pals to sign up for HG's free daily emails. Make sure they know to put your name in the "How did you hear about Hungry Girl" section, and if they're our 10,000th subscriber, you both win! November 20th was National Peanut Butter Fudge Day. We didn't tell you about it 'cuz we figured you were better off not knowing. And it's too late to celebrate now. The new "Top Ate" list is up. View it! Send this email to a friend. Remember, if they sign up and they're our 10,000th subscriber, you'll each win that awesome Hungry Girl tote bag filled with guilt-free snacks!